Keep it HIGH KEY. 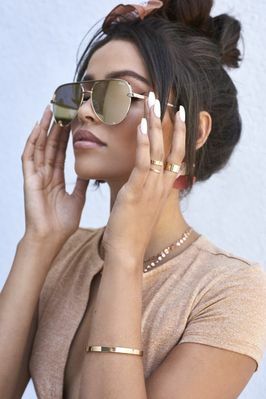 Designed in collaboration with Desi Perkins, this worldwide fan fave has turned the classic aviator on its head. Featuring an oversized metal frame with flat reflective lenses and signature triangle notches. Go for gold with the glowing frame and matching reflective lens.